Developed to meet the needs of both the American and British military during the Second World War, the Medium Tank M4 became one of the most produced tanks in the world. It was reliable, versatile and spawned a number of variants through the course of its production. The tank started life in 1941 as the T6 and was later serialized as the Medium Tank M4. There were two initial models namely the M4, which had a welded hull, and the M4A1, which had a cast hull. The tank entered service in 1942. The M4 was armed with the 75mm Tank Gun M3. This gun had a longer barrel length (compared to the previous M2 model) which allowed a muzzle velocity of up to 619 m/s (2,031 ft/s) and could punch through 102 mm of armor, depending on the AP (Armor Piercing) shell used. It was a good anti-armor weapon, but it was also used to great effect firing HE (High-Explosive) for infantry support. For secondary armament, the M4 had a coaxial and a bow mounted .30 Cal (7.62 mm) Browning M1919 machine gun, as well as a .50 Cal (12.7 mm) Browning M2 heavy machine gun on a roof-mounted pintle. It was well armored for its time, with 50.8 mm (2 in) of frontal hull armor angled at 55 degrees which brought the effective thickness to 88.9 mm (3.5 in). The front of the turret was 76.2 mm (3 in) thick. Propulsion was provided by a Continental radial gasoline engine, developing 350-400 hp. A drive shaft sent the power from the engine in the rear of the tank to the transmission at the front. This powered the drive wheels and propelled the vehicle to a top speed of 22–30 mph (35–48 km/h). The tank’s weight was supported on a Vertical Volute Spring Suspension (VVSS), with three bogies on each side of the vehicle and two wheels per bogie. The idler wheel was at the rear. Before the M4 had even entered production, Aberdeen Proving Ground (APG) received a letter from the Office of the Chief of Ordnance, dated December 8th, 1941 (the day after the Pearl Harbor attack). The letter instructed Aberdeen to start work on developing an improved model with increased mobility and protection. Two designs were submitted. These were Aberdeen Proving Ground’s own and another submitted by Detroit Arsenal. Aberdeen submitted line-drawings and a list of characteristics of their initial design on March 13th, 1942. The proposed vehicle had a number of differences from the first models of M4. It did, however, retain the 75mm M3 tank gun and M34 mantlet, as well as the coaxial and bow mounted .30 cal (7.62mm) machine guns. 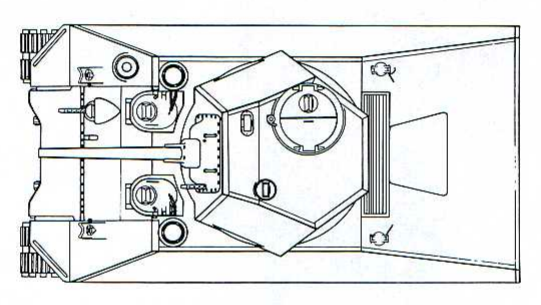 The front hull armor thickness of 50.8mm (2 inches) remained unchanged, except for the bulbous final drive housing. At the time of this design, the final drive housing on M4s was made up of three parts bolted together. This new design did away with that, making it one solid piece. Such housings would later appear on subsequent M4 production models. The vertical portion of the housing, originally 2 inches thick, was increased to 3 inches (76.2mm) and the contour increased to improve effectiveness. The lower side armor (behind the tracks) was also increased from 1.5 inches (38.1mm) to 2.5 inches (63.5 mm). Above the track, on the sponsons, armor was increased from 1.5 inches to 2.75 inches (69.85 mm). The plate was sloped inwards at 30 degrees from the vertical which increased the width the entire hull to 123 inches (10.5 ft) from the original 103 (8.5 ft). The rear plate was also thickened from 1.5 inches (38.1 mm) to 2 inches (50.8 mm). 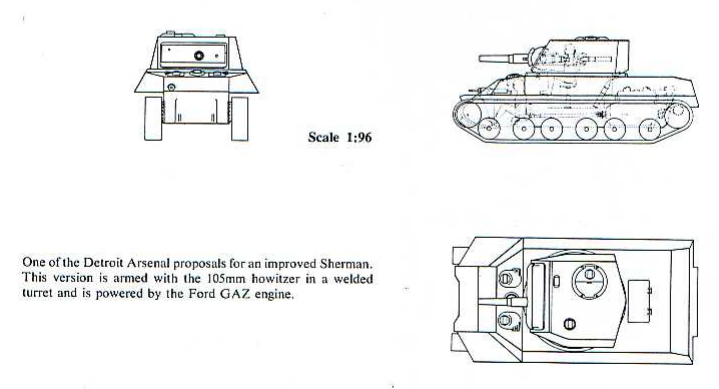 When this design was presented, it was thought that there would be a large shortage of foundry capacity to produce large castings such as those for the M4’s turret. As such, it was decided to fashion the turret from a number of rolled armor plates welded together. 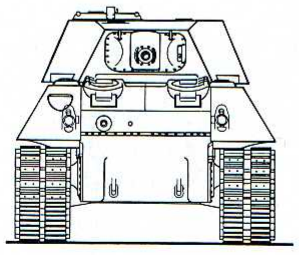 This would give a sharp, angular silhouette to the turret. Representation of APG’s ‘Improved M4’ in a speculative Olive Drab colour scheme that was common at the time of its conception. Illustration by Bernard ‘Escodrion” Baker, funded by our Patreon Campain. It was thought that the original Continental engine would be too underpowered for this new design due to the weight increase from approximately 30.5 tons to 42 tons in view of to the additional armor. Aberdeen proposed the use of the new Wright G200 air-cooled radial engine which would develop 640 hp, compared to the previous 400hp. A large bulge had to be drawn into the engine deck to accommodate the engine. The standard transmission used in the M4 was retained, but the drive shaft from the engine was mounted lower in order to increase room inside the tank. It was expected that this new power pack would propel the tank to about 35 mph (56 km/h) which was a substantial improvement over the 22-30 mph (35-48 km/h) top speed of the standard M4. The weight increase also necessitated changes to the tracks and suspension to support the heavier hull and keep ground pressure to an acceptable limit. Aberdeen chose to use a slightly modified version of the suspension found on the Heavy Tank M6 and the prototype Heavy/Assault Tank T14. This was an early version of a Horizontal Volute Spring Suspension (HVSS). Three bogies were mounted per side, each with two double-wheels. The wheels were 18-inches (45.72 cm) in diameter, apart from the first wheels on the front bogie, and the trailing wheel on the rear bogie. These wheels were larger with a 22-inch (55.88 cm) diameter. The bogies did not have integrated return rollers like the traditional M4 suspension. On this design, there were four mounted directly to the side of the lower hull on each side. The M6/T14’s 25.75 inches (65.40 cm) tracks were also chosen for the tank. Aberdeen surmised that the new vehicle would have a combat weight of approximately 42-tons. Almost 12 tons heavier than the standard M4. The Aberdeen design was not approved for production as there were additional areas that needed further development. Detroit Arsenal continued looking into the possibility of upgrading the M4. They looked into both welded and cast turrets for their design. This turret would have interchangeable front plates enabling it to either carry the 75mm M3 Tank Gun or the 105mm M4 Howitzer or even the M7 3” Gun from the GMC M10 “Wolverine”. Detroit kept the vehicle’s weight to 30.5 tons, around the same as the standard M4. Armor effectiveness would be increased however in a manner similar to the T14. The hull was made considerably more shallow and the raised ‘hoods’ over the driver’s positions eliminated. This turned the upper plate a perfectly flat, sloped surface. The sponson armor retained the standard thickness of 1.5 inches (38.1mm), but was sloped inward at 30-degrees. This increased the vehicle width to 120 inches (10 ft). As the armor was not increased, the weight of the tank did not climb. As such, it was planned that the standard M4 VVSS suspension would be retained. Three engines were considered for installation on the tank. These were the Ford GAZ, Continental R975-C1, and the General Motors 6046 diesel. 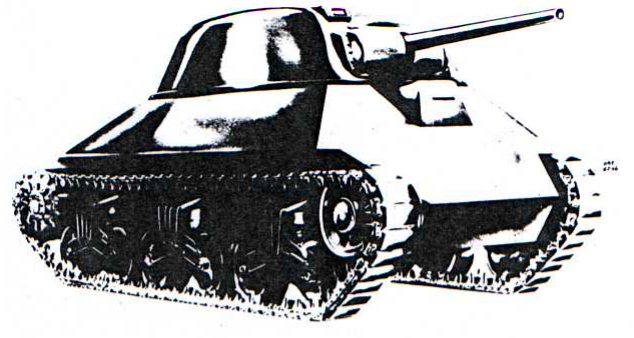 The design programs had succeeded in finding numerous potential improvements for the M4 tank, but there were some design choices that were not such an improvement. Ammunition for the main armament was still intended to be stored in the sponsons. Although this was the perfect place for the loader to access his rounds, it was an extremely vulnerable position. The fuel tanks were relocated from the engine compartment to underneath the turret basket. One can only imagine the catastrophic events that may have occurred should the fuel tanks have been breached and set ablaze. 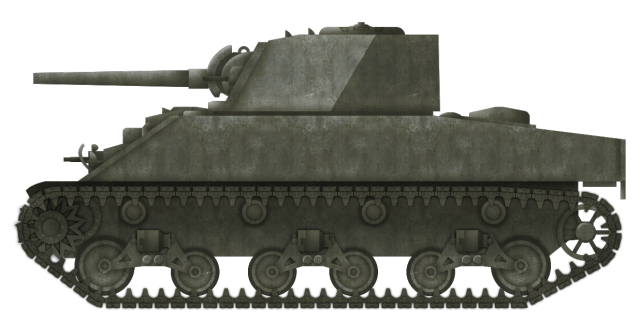 Though neither the Aberdeen or Detroit vehicles were approved for service, however, the work put into the developments were not in vain, as subsequent models of the M4 would incorporate some of the improvements identified in these projects. to be honest, I thought this tank was fake when i saw it in WoT. Highly surprised to see that its real! Keep the great work up, friends! I compare WoT tanks with Tank Encyclopedia, too. You should have put a sherman profil for the comparaison but at least,I know what to do with my heller one.